Within five miles of our Smoky Mountain Accommodation there are multiple places you can rent tubes in Townsend, the two biggest sites are River Rat and River Rage. 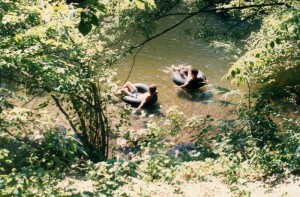 Both float the same or similar spots on the Little River. The key here is to listen to the folks who rent you the tube so you understand the pick up point down river. Unless it is an emergency, you don’t want to get out of the river and cross someone’s private property. I suggest wearing a pair of old tennis shoes. Depending on the amount of rain and the level of the river, there might be a couple of places where you have to stand up and walk a few feet to get into deeper water. If you own your own kayak, you can drive to a location at 4134 Cave Mill Rd. Maryville, TN and River John’s Outfitters will hop in your car with you, and drive you upstream 7 miles. You put in at a TWRA access spot and float downriver to where John has driven your car back to his place. The charge is $20. It is best to make a reservation at 865-982-0793. It takes about 3 hours, so the latest he will drop you off is 4PM. You can also rent a canoe from him for $40, all equipment included. If you want to go white water river rafting, there are a lot of companies you can use. The most popular areas for rafting are the Pigeon River in Hartford, TN just off I-40, the Nantahala in NC on route 19 near Bryson City, and the Ocoee near Ducktown and Copperhill, TN, which is where the Olympics were held a few years ago. Two companies, White Water Rafting in the Smokies and Wildwater Limited, have outlets in Gatlinburg where you can buy your tickets ahead of time. With White Water, their “put in place” is on the Pigeon River in Hartford (along with 17 other companies!) The Wildwater outlet in Gatlinburg can sell you tickets to four different places to raft, three of which are within comfortable driving distance from Gracehill Bed and Breakfast: the Pigeon River, the Nantahala and the Ocoee. The Tennessee Smokies Baseball moved into their new stadium on the outskirts of Sevierville in 2000. Many of their games are evening games so it won’t interfere with daytime sightseeing! The season starts in April and goes to mid September. If you click on the link below the map, it will show the map legend on the left and you can click on the map to get more detail. Hit the back button to come back to this page.